Klinkhammer Olive (Hi Vis Posts) created by Hans Van Klinken. 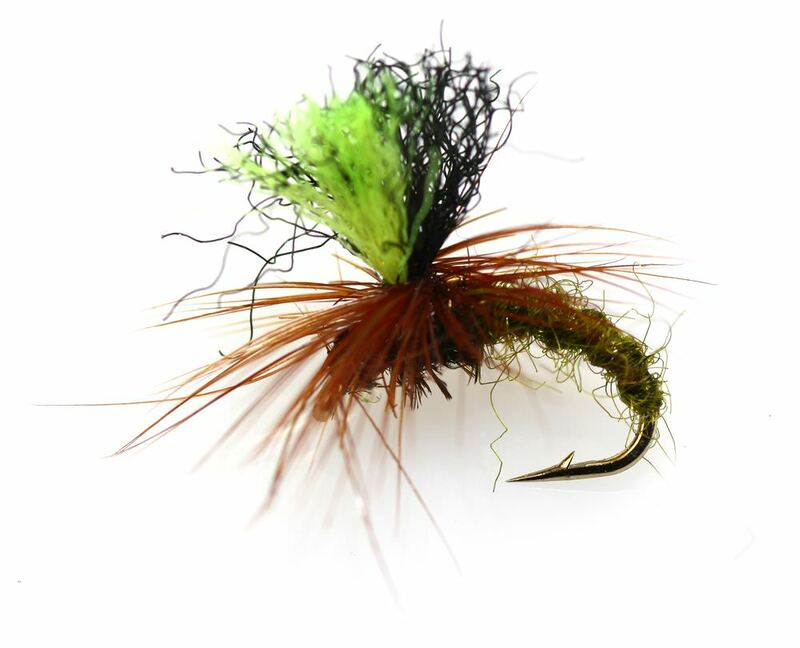 The Klinkhammer Olive (Hi Vis Posts) is an incredible fish catching fly devised by the innovative Dutch fly tyer Hans Van Klinken for trout and grayling. When on a course with Oliver Edwards he said that this fly should be kept in the car glove boxe next to your pack of emergency condoms....... this fly is absolutely incredible, even when fish asre not taking on the surface this fly is known to 'lift' fish.The fly hangs down in the water supported by the parachute hackle. Due to to body of the pupa sitting under the surface while the hackle and wing are on the surface it represents an emerging caddis fly. The Klinkhammer Olive (Hi Vis Posts) is tied with CDC on the post. The Klinkhammer Olive (Hi Vis Posts) is effective on everywhere from English chalk streams to rivers world-wide. At The Essential Fly we tweaked the standard white posted klinkhammer to devise this high visibility variant of the Klinkhammer Olive (Hi Vis Posts) with black and luminous yellow posts. For the more adventurous among you we have provided tying specifications for the Klinkhammer Olive (Hi Vis Posts). Remember at The Essential Fly we sell the Klinkhammer Olive (Hi Vis Posts) at incredible prices with a top quality fly and service to back it up. It is certainly worth tying the Klinkhammer Olive (Hi Vis Posts) yourself to understand the pleasure of catching a fish with your own tied fly, however at the price we sell flies it is only worth tying one or two Klinkhammer Olive (Hi Vis Posts) as your can spend more time fishing instead of tying flies - buy volume online with us. Small, fast mountain streams with a lot of glint being thrown off the surface by the sun - we are talking about the Pyrenees. Every aid to watching the fly is welcome. These are big, robust and very very visible. I got my leg pulled for using such "oversized" flies for dainty mountain trout - but the last time I went back tto one of the streams I noticed another fly fisherman had tied an "oversized" fly just like the ones I had purchased from Essential Fly. Imitation is the sincerest form of flattery! cheers Colin, glad you like them.